Removing about half of the private offices, a new layout reinvents the office environment by opening large apertures of natural light and allowing field views in the thin floor plate, encouraging cross-pollination among departments within a great variety of teaming environments. 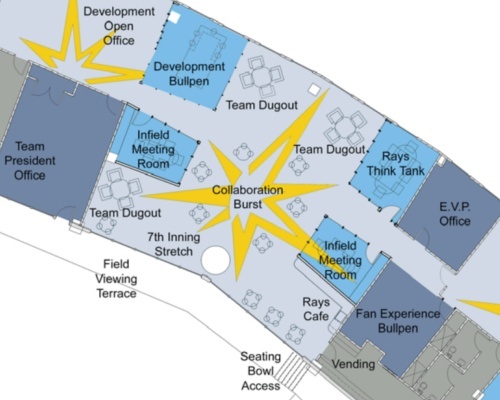 Three key areas of collaboration inject life into the curving pathway, where staff can be “energized through the magic of baseball.” Bold and daring, yet professional and crisp, these interactive zones include three Rays Cafes, multiple meeting space configurations and large gathering opportunities. There were four projects in total. 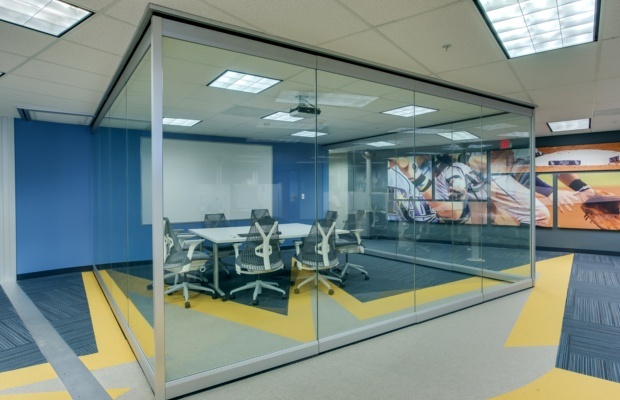 The team of Carlson Studio Architecture & PRA redesigned the existing 30,000 SF 4th Floor Offices of the Tampa Bay Rays. Comprised of multiple departments including Corporate Partnerships, Fan Experience and Marketing, Development, Public Relations, Baseball Operations, Stadium Operations, and Finance. 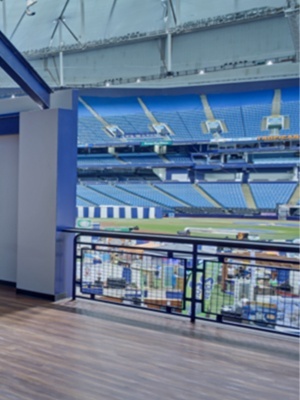 Above you see the results of a commercial renovation of the batter’s eye restaurant and its conversion into the Patio Party Deck at the Tampa Bay Rays’ baseball stadium. 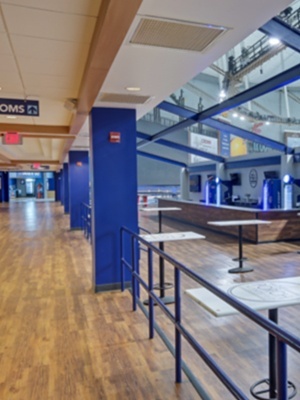 The Patio Party Deck’s location makes it a landmark, a destination where fans gather for an elevated experience before, during, and after the baseball game. It is reached by a continuous loop around the entire lower seating bowl of Tropicana Field. 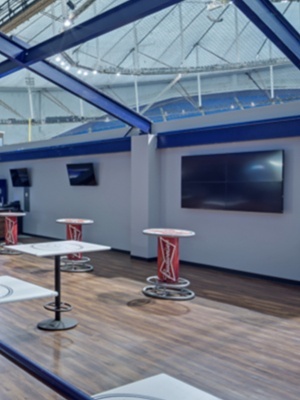 Its theme combines the experience of a “boardwalk”, notably the original St. Petersburg Pier built of wood in 1889, and the image of the “walk-off” home run, indelibly etched in the psyche of every Tampa Bay Rays fan since Game 162 of the 2011 Season. Together the history of St. Petersburg and the excitement the Rays have brought to this city will come to life in the Rays Walk Off Porch. This area is approximately 11,000 SF. 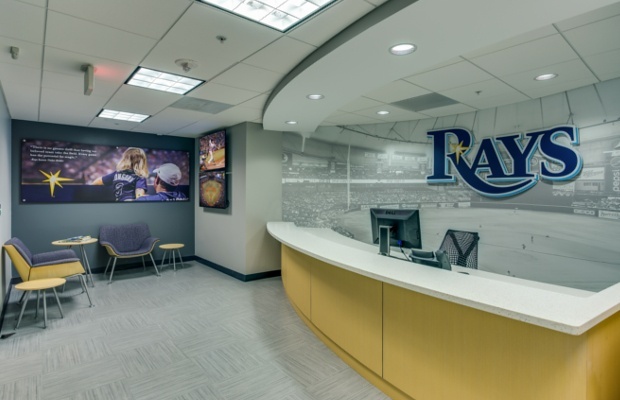 Work included creative direction to implement a showcase of the Rays’ involvement in the community, portraying this concept along the corridor and at the entry doors to the existing suites. The area represents approximately 1,400 lineal feet of corridor. Detailed wall finishes, colors, patterns, and materials applied to the existing corridor walls and associated accent lighting were selected. 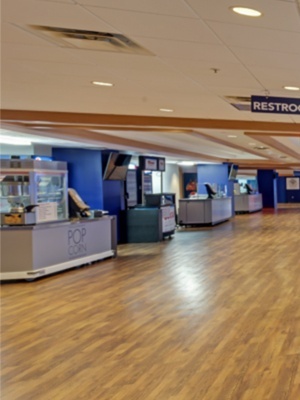 Interior elevations and details of the two primary corridor walls (walls on each side of the corridor) were created, as well as three interior color renderings of typical design conditions and suite entry signage recommendations. Finally, recommendations for incorporating design features in entry lobby area and adjacent to main corridor were designed.